Which Perceptual Map Template Should I Use? What is a Determinant Attribute? The above multi-attribute perceptual map Excel templates allow you to map up to 12 brands and up 12 attributes at the same time on the same perceptual map. What are the competitive sets in the market. Traditionally, multi-dimensional scaling (MDS) to create a multi-attribute perceptual map required access to a statistical package (such as SPSS) or the purchase of an additional program to help Excel run the analysis (such as XLSTAT). Most perceptual or positioning maps are simply constructed using two product attributes (click for examples of attributes to use in a map), commonly referred to as determinant attributes. While this is highly effective as a teaching technique for marketing students at the university-level, it is sometimes a very limited or restrictive approach to thinking about how consumers make decisions in real-life. By constructing a perceptual map with only two product attributes, the marketing team is making the assumption that the average consumer in the target market makes their purchase decision based on these two attributes alone. While that may sometimes occur in a low-involvement purchase decision, it is unlikely to be the case in most consumer’s selections between competing products and brands. Therefore, it is usually important and far more reflective of real-life purchasing decisions, to present a perceptual map that uses multiple attributes. In this case, what is known as a multi-attribute perceptual map. Typically, to create a multi-attribute perceptual map, the marketing team will need to conduct an image or positioning survey with consumers in their target markets. Then using the above free Excel template, a combined perceptual map showing the various competing brands against a range of decision attributes can be shown. Companies that have access to larger budgets and hire professional marketing research firms will generally produce multi-attribute based perceptual maps. However, it is quite easy to construct a perceptual map in this format using the above free Excel perceptual mapping template. 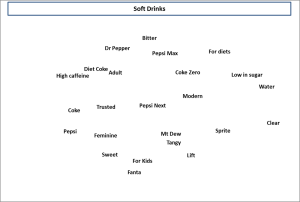 The following perceptual map for the soft drink market has been constructed by using the free Excel spreadsheet above. 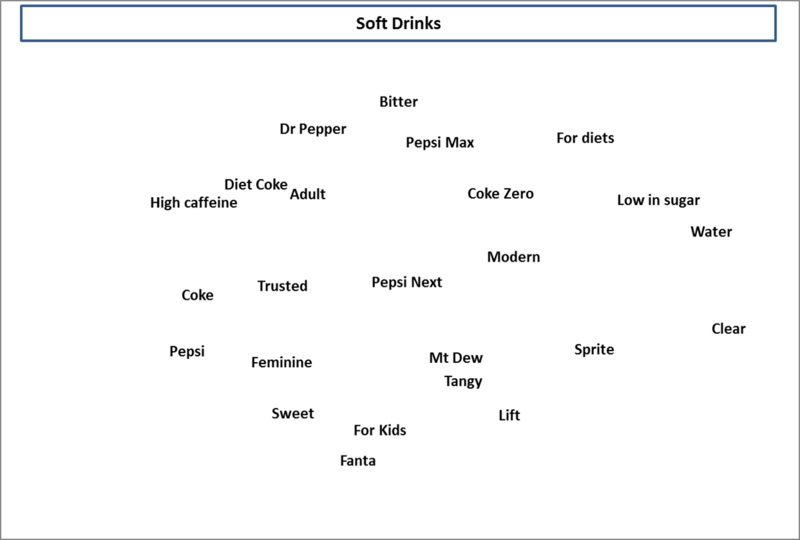 As you can see (click the map to enlarge), various soft drink brands, such as Coke and Pepsi, have been mapped alongside five different product and image attributes. In this case, the attributes used are: fun, traditional, sweet, energetic and young. These product and brand attributes have been highlighted in blue on the perceptual map. To better understand the consumer’s perceptions in this market, a number of various brand image and actual product features have been used in combination on the same perceptual map. The goal of the marketing team here is to create a more complete understanding of how consumers perceive the various competitors in the soft drink market, by consider multiple attributes in the purchase decision. Also see how to interpret multi-attribute perceptual maps.